Is one week enough time to prepare for a disaster like Hurricane Florence? One week- seven days- a lifetime for some and a few breaths for others. But, what if you are an employer? Your responsibilities multiply! In addition to your personal needs, your responsibility includes the needs of your employees and your business. You must walk the tightrope between staying open and continuing to provide services and products to a more desperate and needy community and closing to provide employees time and ability to care for their own families. In addition, you have responsibilities to your employees and a natural disaster doesn’t eliminate those responsibilities. Instead, it becomes more critical than ever, to ensure employer compliance to federal employment laws such as the FLSA and FMLA. Keep reading for a comprehensive overview of what you need to know in such times. 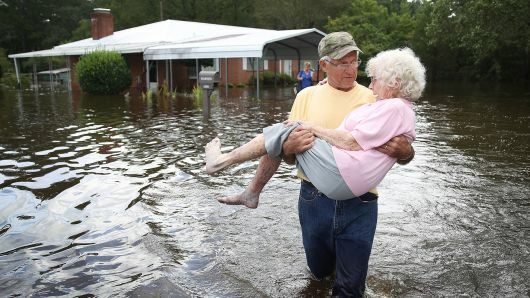 Hurricane Florence may have retreated, but the devastation continues to rise. Flooding, destruction, and mayhem continue in the wake of mother nature. For employers, the disaster is two-fold. In addition to recovery on a personal level, they are also concerned with their employees’ safety and the viability of maintaining their business. In addition, there are additional compliance issues that arise during and following a disaster. While maintaining compliance to employment and labor laws can be overwhelming during normal times, it becomes a source of major stress and worry following an emergency. That’s because the normal resources you rely on may be out of commission or unreliable. Paying Employees: Local Bank, Accountant, or Payroll services? Managing Employee FMLA and the requirement records required? Record Issues: Lost, Destroyed or Unaccessible? Overtime Pay: Is it Still Required? The employee misses work due to the business or their department’s temporary closure. Each of these situations requires different responses from the employer. It is critical to identify whether or not the employee was free to work or not. First, let’s discuss what happens an exempt employee is unable to complete a full day of work. The Fair Labor Standards Act (FLSA) law requires that exempt employees be paid for any partially worked days. This rule applies regardless of the number of hours the employee words during the day. If an exempt employee works at all during a day, they must be paid an entire day’s wage. This rule applies regardless of whether the business closes mid-day or the employee must take off for safety or personal reasons. The key is that the business must be open or available for the employee to work. The second key is that the employee misses work for personal reasons. If the employee misses work due to sickness or disability, then the employer can only deduct the day’s wage if the employer has a plan that compensates the employee for salary lost due to illness. Under FLSA law, exempt employees who are available for work, but for whom no work is available, cannot have their pay deducted unless they perform no work in the entire week. Otherwise, they are at risk of losing their exempt status according to FLSA rules. Employers can deduct the employee’s PTO balance for missed days of work. PTO balances can be used to pay for full missed days of work. 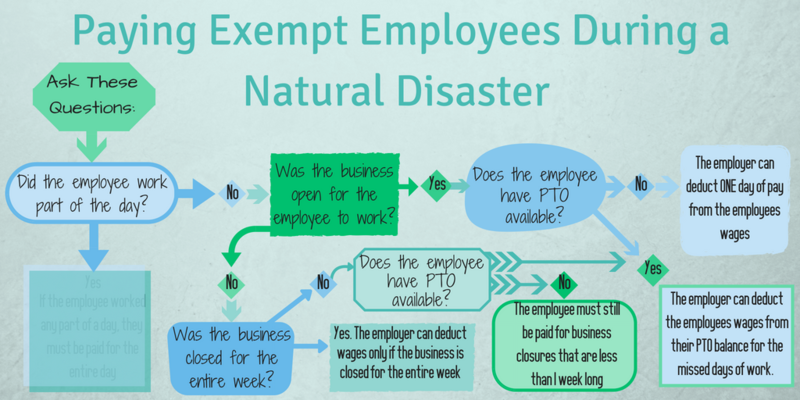 If the employer closes for the entire week due to the emergency and damages from the natural disaster, then the employer is not required to pay exempt employees for the missed week of work. It is important to note that if an exempt employee works at all during the week- they must be paid for the entire week unless the employee chooses to miss entire days of work. Under federal law, nonexempt employees must only be paid for hours that are worked. Neither North or South Carolina have laws that require employers to pay non-exempt employees for hours that are not worked. Even if the employee shows up for work, but does not work, the employer is not required to pay the employee. 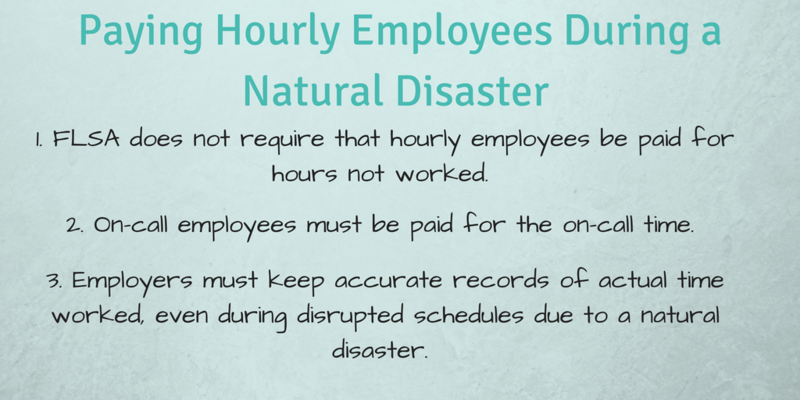 However, it is vital that employers maintain accurate records regarding when and how long hourly employees work during and following the natural disaster. It is also for employers to be aware of how the FLSA views “on-call” employees. If you have employees who are on-call for work during the cleanup, then there are a few things to look at. FLSA rules define on-call employees as employees who are required to be at or near the workplace who are not able to work and are not able to use their time for personal time. For example, an on-call employee might be a bank employee who stays at the bank during a temporary closure due to a power outage, but who is not able to work. In this situation, employees must be paid for their on-call time. Employees who are allowed to use their time for personal reasons, requests and must simply call in to determine if work is or will be available are not defined as on-call employees according to the FLSA. 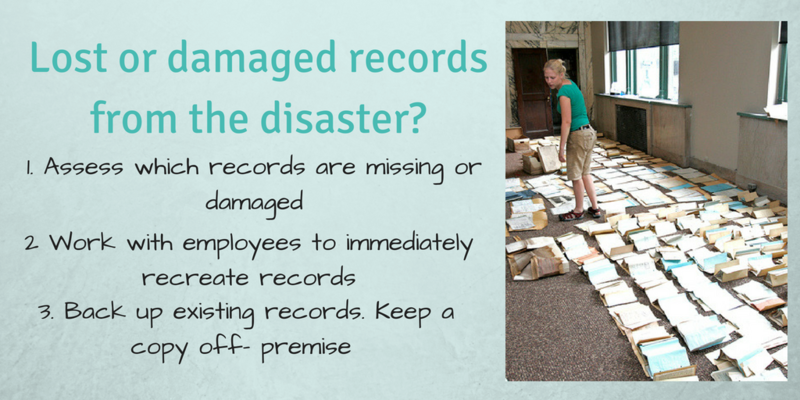 What do you do if your employment records have been destroyed or lost? Rampant flooding across the Carolinas has kept many businesses under water. This means that if your employee personnel files or your payroll records are held in filing cabinets, they may not be legible anymore. There are several steps you can take. On average a lost document costs business $122 to replace. But the lost of irreplaceable documents is higher than that. As soon as you are able to get into your business, take inventory of what records you have. What records are partially or fully duplicated electronically? If you use an automated timekeeping system like SwipeClock’s, then you can call obtain a copy of all time records and be able to still pay your employees in a timely manner (a vital compliance requirement). If you are still using punch cards, manual timesheets, or other physical time clocks, then you will need to immediately get to work recreating employee work records. It is important that you recreate your documents as quickly as possible. Do not wait until weeks or months have passed and an employee has sued you for a wage violation. At that point employer guilt will be assumed by the law. Contact your employees and request their help in recreating what hours they worked. Employees should fill out new time cards to the best of their memories. It would also be a good idea to have the employees sign that the records are to the best of their recollection. Then, in the case of a future dispute, you have the employees own record that they have provided according to their memory. The note should also state that you have the right to change or update the records if new information becomes available. Next, make sure that you back up the replaced records. Unfortunately, some employers fail to back up their new records and experience a secondary loss of records. This means a high loss of credibility with employees and exponentially increases the chances the employer will be found guilty of labor law violations. It is important to remember that The Department of Labor, FLSA law, and most state and local laws assume employer guilt if the employer does not have adequate records. Employees who allege employer violations need very little proof. The burden of proof for compliance rests on the you, the employer. Thus, it is vital for you to prepare and to move forward with backed up copies of employee records. It is too late to prepare for Hurricane Florence, but Carolina employers can start backing up paper records. Consider moving to automated timekeeping and payroll. Check with your accounting partners and find out if they keep copies of accounting records offsite. Consider keeping a copy of your records in the cloud. Simply put, the cloud is another way of stating that a server with a location away from your physical location will store your information. The reduces the risk of records destruction by a natural disaster. Then, when another emergency occurs, you will be prepared. Even if you have to move locations or evacuate, an internet connection will allow you to pay employees timely and to view records. Even after a natural disaster, employers must make reasonable accommodations for employees with disabilities. The American Disability Act prohibits discrimination against employees with disabilities. However, there are a few things for you to remember. Employee needs and disabilities may be caused or exacerbated by the natural disaster or the stress of the emergency. Employees may be permanently injured or may have a mental illness flare during a crisis. Employers should be aware of these possibilities and plan accordingly. In addition, you should consider the physical needs of your employees. Are working conditions safe for employees to return to work? 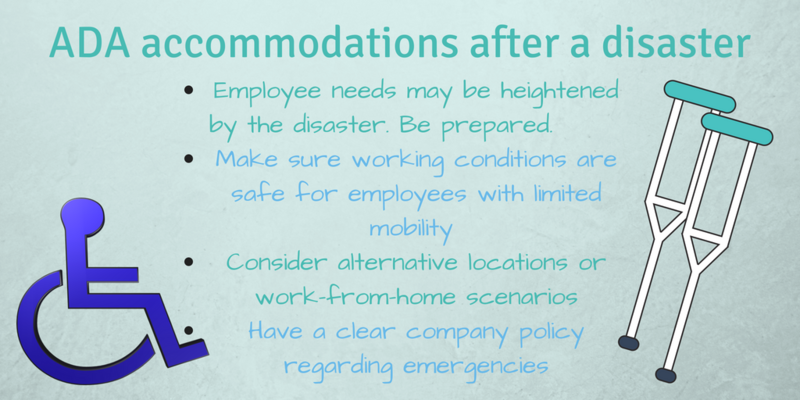 While rebuilding a flooded out ramp may not be the most urgent task at hand, it is important that you consider what accommodations can be made for employees. This can include remote working conditions. During flooding and cleanup, some employees may work from home or from temporary locations. Exempt employees who work, even a few minutes from home must be compensated for the entire day’s salary. Hourly employees must be compensated for all time worked, even when they worked without permission from a manager. Do you have a policy that covers emergency situations? As an employer, you should have a clear policy regarding situations when employees must work from home. The policy should be clearly communicated. This will help eliminate employee confusion and reduce possible absences. Your employee handbook should outline the calling tree that employees can reach out with questions, general guidelines and contingency situations, and other expectations you have during and following a natural disaster. Wage Delays from the Disaster. What if I can’t pay my employees on time? In some situations, your business may not be able to pay employees on the regularly scheduled payday due to Hurricane Florence. This may be because your records are underwater, your accountant is unavailable, or your payroll employees have evacuated. It may be because your local bank has limited staff available, or because of limited services such as the internet or electricity. Do you know what the requirements are in your state? North Carolina law requires that employers pay hourly employees at least monthly. Therefore, in the case of an emergency, you must make sure that your employees are paid, at a minimum, within a month of their last paycheck. South Carolina does not have a law that requires any specific pay periods. However, it would be wise for you to ensure that you get hourly employees paid at least within a month’s timeframe to avoid potential DOL lawsuits. The Department of Labor allows for longer time periods, but they should be detailed in the employee handbook. 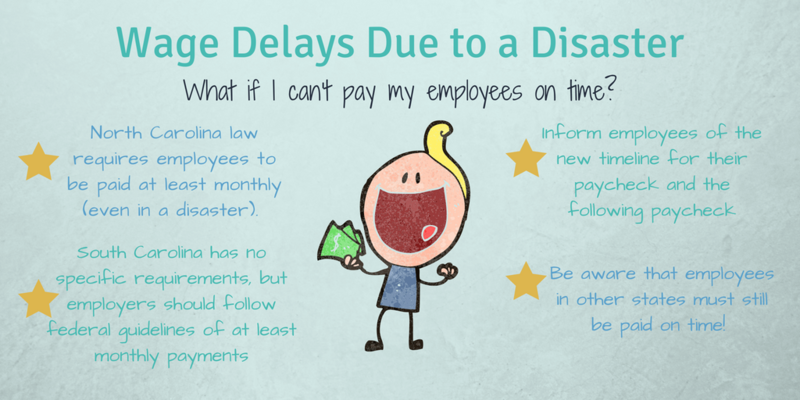 In an emergency, you are discouraged from taking longer than a month to pay hourly employees. If you, as the employer, are unable to meet these deadlines, then it is vital that you communicate with your employees. You should provide expected pay times with the employees immediately. Consider providing 1- the date of the last payday, 2- the first new payday your employee can expect, and 3- the next expected payday. As an employer, you should notify employees in writing. A phone call or personal conversation is a great way to check on employee welfare, but all information regarding paychecks should also be communicated in writing so that the employee can refer to it. This will also protect you from misunderstandings. If you have to make changes to the pay dates, then inform your employees as soon as possible of all changes. What happens if I have employees in other states? You should be aware that other states are generally not as lenient when records are destroyed elsewhere. You will still be under the legal obligations of all states you have employees working. You will also be subject to penalties due to delayed payments and any other employment labor fines and penalties that may occur. Businesses should do the best they can to process employee payments, communicate changes, and document the full reasons for delays of employee paychecks for future reference. 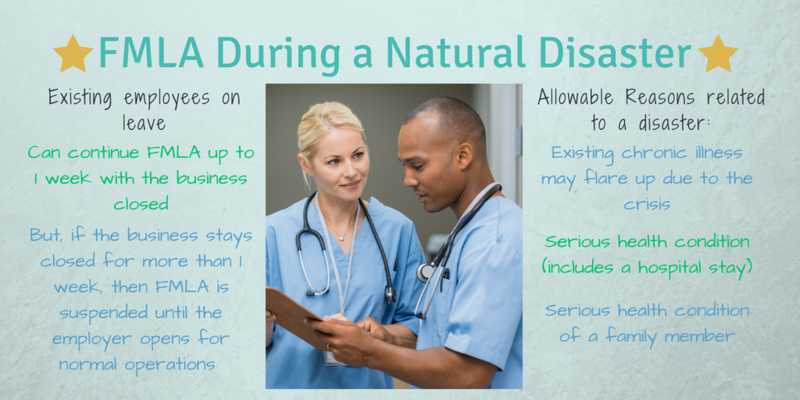 The Family Medical Leave Act provides many protected reasons for employees to take leave, but a natural disaster is not specifically mentioned. However, many employees do have qualified leave after a natural disaster due to the other protected reasons. First, the stress and extreme natural environment often cause chronic health conditions to flare up and be more of a problem. This can include mental illness or physical ailments such as asthma, diabetes, chronic anxiety, and other issues. Employees can also take leave due to a serious health condition. Simply put a serious health condition would include any condition that requires at least an overnight stay in the hospital or other care facilities. Thus, if an employee is injured due to the natural disaster, they qualify for protected leave. Employees can also take leave due to a family member’s chronic health condition or serious health condition. This includes children, parents, and their spouse. What happens to employees already on FMLA leave when the business temporarily closed due to the emergency. Employees who are already on FMLA leave at the time of the business closure can stay on FMLA leave if the business closes for a week or less due to the crisis. If the business is closed for more than a week, then the employee’s FMLA leave is paused until the business resumes normal operations. It is vital that you maintain adequate records of new and existing FMLA leave. Even though the community and your business may be in shambles, FMLA requires specific disclosures and notices when employees take a new leaf. Is Overtime Still Required During an Emergency? FLSA law requires hourly or non-exempt employees to always be paid overtime. This requirement is not waived due to any emergency situations. Employers must maintain accurate records and pay employees for time worked during the crisis. Don’t assume that because a thing is hectic, dangerous, or stressful, that your business will be exempted from this requirement. Another labor law that you should know as an employer: employees can NEVER volunteer for their business. The community as a whole may organize recovery efforts. You may even have employees who are willing to pitch in and help clean up the business property. But, these employees can never volunteer. 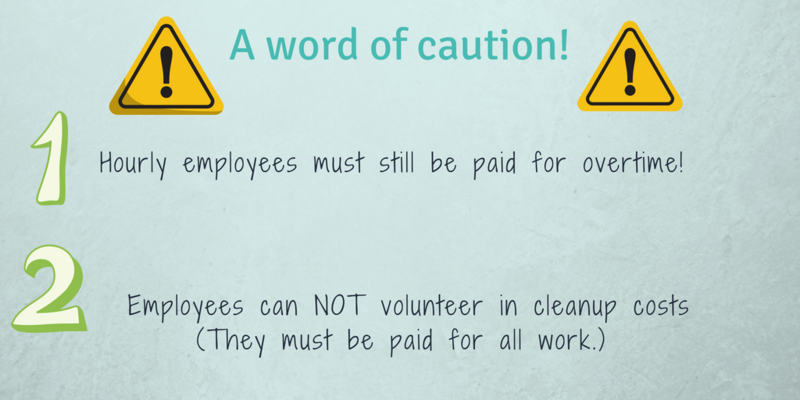 If in any cleanup activities, employees are assisting, they must be paid full wages for their help. This is vital for you to understand and follow so that you don’t find yourself at the wrong end of a Department of Labor example fines. In conclusion, natural disasters and other emergencies do not alleviate employers from their responsibilities. This includes timely payment of wages, record keeping, and compliance with FMLA and other employment requirements. Although, your business may have been unprepared for all the repercussions of Hurricane Florence, taking the right steps now can help to protect you against future wage lawsuits and other accusations of compliance violations. Because the DOL assumes employer guilt when records go missing, it is especially vital to maintain accurate records of timely pay, compliance with FMLA, and to document the recreation of destroyed documents. Doing this will help to protect your business in the months and years to come.